Disadvantages: USD price expensive for a model magazine (but not for a Reference Book). "Model Expert" is a magazine published in Greece by Periscopio Publications that covers a broad range of modelling subjects. The book being reviewed is the second issue of an English-language special "Aviation Series"
As the name of the series implies, this soft-cover book focuses on aircraft modelling. It has 84 pages (including the covers), it is published in full-colour on high quality paper and the text is all in English. "Aviation Series No. 2" follows a sensible formula. Modelling articles are supported by colour profiles and reference photos. The 50 profiles are a real highlight of this publication. 44 of these have been produced by Richard J. Caruna (who also contributes a reference piece on Stukas over Malta), while the remaining 6 are by Mihalis Solanakis. The standard of modelling, photography and profiles is very high indeed. I reviewed an issue of the "Model Expert" magazine around this time last year. A few of the shortcomings discussed in my original review have been addressed with this new publication. 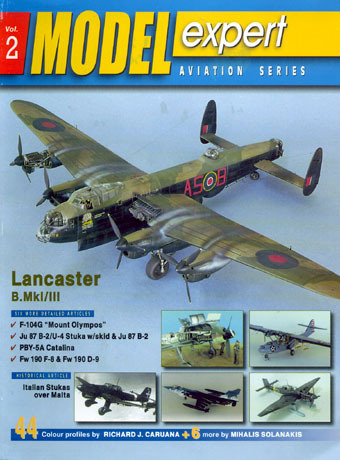 The full English text makes this book relevant to modellers worldwide, and availability from Squadron takes care of the availability issue. The USD$18 price struck me as high. Despite the lack of advertising (a key factor in pricing a publication such as this) "Aviation Series No. 2" still presents like a magazine. A magazine such as Replic or SAMI can be had for less than USD$10. Nevertheless, eight full modelling articles is more than one would expect in a standard modelling magazine, so you do get significant "bang for your buck". Furthermore, my price preconceptions are different for a Reference book. The colour profiles, line drawings and contemporary photographs certainly makes this publication a useful reference for Stukas in particular. Viewed as a Reference book, USD$18 sounds more reasonable. "Model Expert - Aviation Series No. 2" is a well executed aviation modelling special. If you are interested in Stukas, Fw 190s or are building Tamiya's big Lancaster, this will be a very useful publication.